NEW! VEGAN. Amino 21 Mix: 20 amino acids (8 of which are essential), all free form, which makes them more nutritive than 100% pure amino acids and organic sulfur MSM. The fact that these amino acids are free form makes it possible for the body to absorb them without having to digest them first. Amino acids play a key role in balancing your mood, attentiveness, concentration, aggression, vitality, immune system and sleeping patterns. Cells are constantly being destroyed in our bodies and new ones need to be formed. Essential nutrients that are vital to life. This nutritional supplement contains 20 free-form amino acids, 8 of which are essential to the human body (essential = life-critical). The fact that these amino acids are free form makes it possible for the body to absorb them without having to digest them first. Followed by eating carbohydrates optimizes absorption. Don't be fooled: The body has to split 100% pure amino acids before it can digest them. 100% pure amino acids are of lower quality than free-form amino acids, which the body does not have to digest and can absorb immediately! There are a number of products available that are ""pure"" but not ""free-form."" Yeast-free, lactose-free, gluten-free, no eggs, soy or wheat products. Does not contain: sugar, artificial preservatives, artificial colors, flavors or aroma. 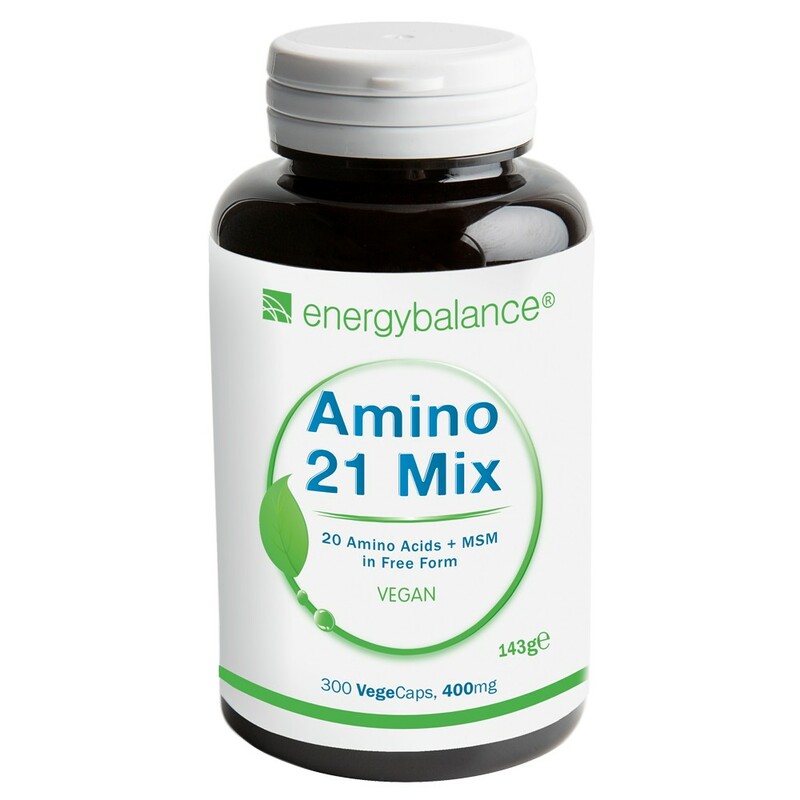 Take 5 capsules of Amino21mix with a little water twice a day 15 minutes before eating (= 10 capsules at 400mg or 4g/day). Amino acids are sensitive to moisture. Store them in a dry place with the lid tightly closed. Moisture can cause some amino acids to decompose. Keep out of reach of children. 20 free-form amino acids, MSM, anti-caking agent (magnesium stearate), cellulose (VegeCaps).